Notes: Tour happens rain or shine, but thunder and lightning will cancel the tour. Picnic with the Office of Public Art! 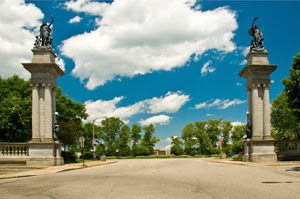 Learn about the Guiseppe Moretti sculptures that flank the entrances to Highland Park,Horses and Welcome. Bring your picnic snacks, and we will picnic in the park after the tour. We will provide the dessert.